RANTES (or Regulated upon Activation, Normal T-cell Expressed and Secreted), also known as CCL5 (Chemokine (CC chemokine ligand 5), is a protein classified as a chemotactic cytokine or chemokine. Chemokines are small soluble proteins that act as molecular signals to induce cellular migration during inflammation. 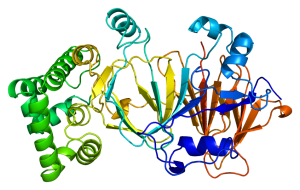 RANTES is a member of the CC chemokine family and is involved in immunoregulatory and inflammatory processes. RANTES is expressed in a lot of immune cells and acts as a potent chemoattractant for T-cells, basophils, eosinophils, monocytes and other cell types by playing a major role in recruiting leukocytes into inflammatory sites and to activate them. RANTES also induces proliferation and activation of certain natural killer cells. RANTES synthesis is induced by TNF-alpha and IL-1 alpha, interacts with CCR3, CCR1 and CCR5 and activates some G-protein coupled receptors. Many of the biological activities of RANTES (Ca2+ influx, chemotactic response, basophil activation, T-cell signaling) are observed between 40 and 8000 ng/mL.